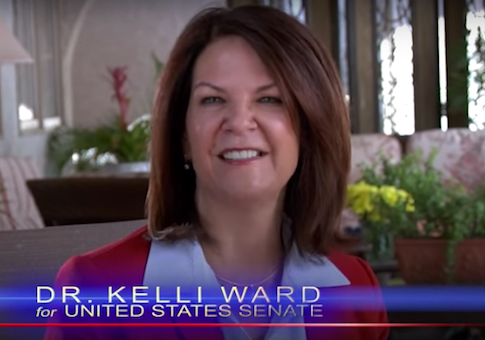 Kelli Ward, the chief primary challenger to Sen. John McCain (R., Ariz.), describes herself as pro-life and attacked the incumbent senator for not taking a hardline approach to defunding Planned Parenthood. Ward, a doctor and former state senator, did not always take a tough stance on abortion. In a 2012 interview, around the time she was elected to represent Arizona’s 5th District, Ward indicated she wanted the government to play no role in a woman’s decision to have an abortion. "I think the government has come too much into the doctor-patient relationship in all areas, and I think abortion is one of those areas. My preference would be that a patient and a doctor talk to each other about the risks, the benefits, what is the potential outcome for the mother should she choose to have a procedure like that, instead of having the government trying to make those decisions," Ward told a reporter for Arizona’s Yellow Sheet Report. The article noted that Ward defined herself as pro-life but that her professional experience as a doctor offered her a "different viewpoint" from other Republican state lawmakers. The article, headlined "Can’t We Talk About the Important Stuff?" also said that Ward desired to talk about "more important things" such as employment and the economy rather than divisive issues such as abortion. "We need to be focusing on those rather than focusing on the things that tear us apart," Ward was quoted as saying. A spokesman for Ward’s campaign said that she "had no prior experience in politics and very little in talking to political reporters" when she made the comments in 2012. "When this article was written, Dr. Ward had not even been sworn into office and was ready to get to work on realistic legislative priorities," spokesman Stephen Sebastian told the Free Beacon in an email. "She had no prior experience in politics and very little in talking to political reporters. As a physician who has never performed abortions in an era in which abortion is the unconstitutional law of the land, she has nevertheless had to counsel patients about ‘the risks, the benefits’ of abortion, as she would about any other invasive procedure." He noted that she has maintained a pro-life record in the state senate and supports a proposed "human life amendment" to the U.S. Constitution. Sebastian accused McCain of voting for "massive, complex spending bills that include funding for Planned Parenthood, which sells dismembered baby body parts." McCain voted against the most recent omnibus appropriations bill last December, which fully funded Planned Parenthood. Ward, who stepped down from her post in the state senate to focus on the primary race against McCain, is running as a "pro-life, pro-family, and pro-freedom" conservative. She unleashed attacks on McCain last year for not supporting a government shutdown amid the fight to defund Planned Parenthood, the nation’s largest abortionist, after a series of secretly-filmed videos appeared to show executives discussing the sale of aborted fetal body parts. Ward accused McCain of flip-flopping in a fundraising ad. "I have had enough. If McCain can’t even muster the strength to stop abortionists from selling baby’s body parts, then there is no chance he will fight for anything else," she wrote in a fundraising email to supporters in August, The Hill reported. Ward also released a video targeting McCain over the alleged "flip flop" and linked him to President Obama. Pro-life advocates saw Ward’s 2012 comments as troubling despite her hard stance against Planned Parenthood last year. "Her statements certainly do raise questions about her self described label ‘pro-life,’" Marjorie Dannenfelser, president of the Susan B. Anthony List, told the Washington Free Beacon in a Thursday statement. "She has staked out the old, morally incoherent Mario Cuomo ‘personally pro-life’ position. Senator McCain’s pro-life position is solid and verified." The National Right to Life PAC endorsed McCain for reelection on Tuesday, commending him for supporting pro-life measures that protect mothers and unborn children. McCain cosponsored legislation to protect unborn children after 20 weeks, the group noted, and repeatedly voted to block federal funding to Planned Parenthood. The organization knocked Kirkpatrick for cosponsoring the Women’s Health Protection Act, which would invalidate many state and federal limits on abortion. "All voters who are concerned with the right to life and with the protection of the most vulnerable members of the human family should vote to return John McCain to the U.S. Senate, so that he can continue to work to advance vital pro-life public policies," Carol Tobias, president of National Right to Life, said in a statement. Update 2:30 P.M.: This post has been updated to reflect recent polling showing McCain with a considerable advantage over Ward. This entry was posted in Politics and tagged 2016 Election, Abortion, John McCain. Bookmark the permalink.